Many people know what their blood type is and understand that blood types must be matched in a medical emergency. The ABO blood group is the most significant blood factor in clinical applications involving blood transfusions. Understanding the importance of the ABO blood group is not limited to clinical applications, however. With our recent ability to rapidly sequence genes, the ABO blood group is also proving to be a valuable asset for determining human migration patterns and origins. ABO blood types are determined by a cell surface marker that identifies the cell as belonging to "self" or to that individual. These cell surface markers are characterized by a protein or lipid that has an extension of a particular arrangement of sugars. 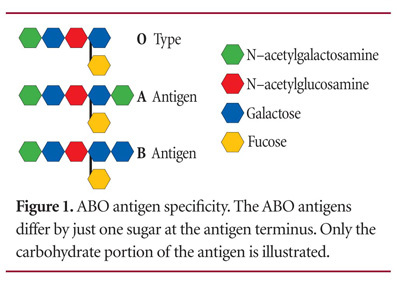 Figure 1 shows the arrangement of sugars that determines each of the A, B, and O blood types.1 Note that each is identical, except that types A and B have an additional sugar: N-acetylgalactosamine for A, and galactose for B. These sugar arrangements are part of an antigen capable of stimulating an immune response that produces antibodies to identify and destroy foreign antigens. People with blood type A produce antibody B when exposed to antigen B, and those with blood type B produce antibody A when exposed to antigen A. Blood type AB, however, produces no antibodies because both antigens present on the cells are recognized as "self." Blood type O produces antibodies A and B, because neither antigen A nor B is present on the cells of type O individuals |Table 1|. Antibodies A and B belong to the "M" class of immunoglobins and are expressed from the immunoglobin genes of B-cell lymphocytes upon exposure to foreign antigens. Immunoglobin genes are capable of producing an essentially infinite number of antibodies through a complex editing and selective process.1 Consequently, there isn't a specific "antibody A" gene or "antibody B" gene inherited with a complementary A or B antigen. A gene for the specification of antigens A or B or type O determines the blood type. An enzyme, glycosyltransferase, is the product of this gene,2 and differences in the sequence of this enzyme (polymorphisms) determine whether the enzyme attaches N-acetylgalactosamine (antigen A), galactose (antigen B), or no sugar (type O) |Figure 1|. People inherit two genes for blood type; or, more accurately, two alleles, one from each parent. These alleles are represented as IA for type A, IB for type B, and i for type O. Both glycosyltransferase alleles for antigens A and B are expressed when inherited together, producing both antigens and resulting in blood type AB. When the allele for blood type A or B is inherited with type O, the individual will be either type A or B. This is not necessarily because the type O allele is silenced or recessive, but is instead a result of the activity of the A or B glycosyltransferase, while the glycosyltransferase for the O allele is inactive.2 A type O individual has both alleles for the inactive glycosyltransferase. So what light does this shed on human origins? Is it possible for the two people of the Creation account (Adam and Eve) or the eight people on Noah's Ark to give rise to all of the ABO blood types present in humans today? 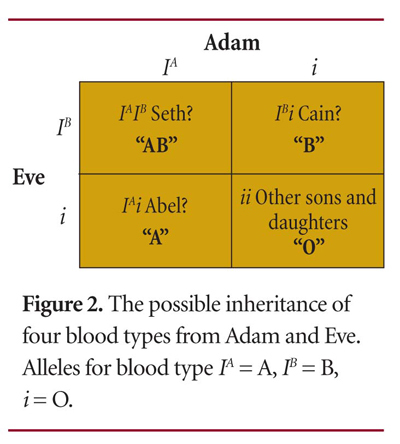 If Adam and Eve were heterozygous for blood types A and B, respectively (one allele for type O and one allele for either type A or B), they could have produced children that had any of the ABO blood types, as illustrated in Figure 2. The Punnett square simply predicts what the possible phenotypes would be for a given couple's children. From the number of children that Adam and Eve likely produced, it is not difficult to envision all of the ABO blood types being passed down to their offspring. If Adam and Eve were heterozygous for the ABO blood type gene locus, then the allele frequency for the type O allele is 50 percent (2 of 4 alleles), the allele frequency for type A is 25 percent (1 of 4 alleles), and the allele frequency for type B is 25 percent |Figure 2|. If there are no selective pressures or genetic drift for these alleles, then the allele frequency will remain constant through all of their descendants. The overall allele frequency in the Punnett square is actually the same for the children as it might have been for Adam and Eve. This scenario would also be true for Noah's family and their descendants. Do human populations today reflect these allele frequencies? The answer is yes. 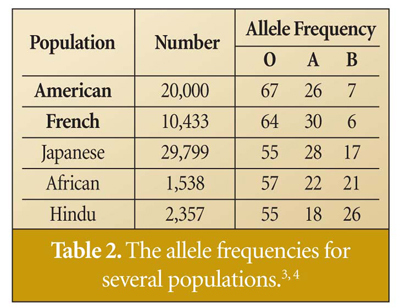 Table 2 shows the allele frequencies for several populations. (Note that these are not blood type frequencies.) There is a general increase in the frequency of the type O allele, and in many populations a drop in the type B allele. But as expected, the frequencies for each allele are close to what they could have been at the start of human history or with Noah's family. The shift in frequency (the increase in type O and decrease in type B) can be caused by migration of people groups that had a higher or lower frequency for one of the alleles at the time of migration. It could also result from random genetic drift, or from a mutation that renders glycosyltransferase inactive--which would result in blood type O from type A and is likely one cause for the increase in the frequency of the O allele. There are DNA differences, or polymorphisms, that determine the function of glycosyltransferase, resulting in different ABO blood types. These differences are few, but not trivial. The glycosyltransferase specific for antigen A synthesis differs from the antigen B-specific enzyme by just four amino acid residues (out of 354), and there are several DNA sequence differences in the alleles that code for the A- and O-specific enzyme.2 The four differences between the A and B glycosyltransferase are enough to allow the enzyme to specify the characteristic terminal sugar that distinguishes antigens A and B. A single DNA deletion in the A-specific allele results in a truncated version of the glycosyltransferase gene product, eliminating enzymatic activity and effectively resulting in blood type O. It can be argued that one of the three alleles is ancestral to the other two. For example, the origin of the O allele, and subsequently blood type O, is simply the result of the deletion resulting in a loss of function of glycosyltransferase activity for the A antigen. A mutation resulting in the loss of function in a protein, at best, would be a "nearly neutral" mutation since blood type O does not appear to have any deleterious effects or selective advantage over the other two blood types. Because neutral or nearly neutral mutations have no selective advantage, it is likely impossible to fix these mutations in a large population of organisms (fixation = 100 percent O alleles) in a reasonable length of time. For example, if a mutation that gave blood type O were actually 1 percent more beneficial than type A, it would take 100,000 generations to fix this mutation in the modern human population from a beginning population of 10,000 people.7, 8 The larger the population at the time of the mutation, the longer it will take for fixation and the less likely the mutation will ever be fixed. Molecular evolutionary time scales place modern humans at roughly 200,000 years ago,9 a timeframe too short to increase the O allele frequency to 60 percent of all people alive today within a population of 10,000. Certainly a biblical timeframe would be far too short for such fixation. The deletion responsible for converting an A allele to an O allele is not present in chimpanzees, and sequence comparisons between humans and chimps indicate this allele is unique to the human lineage,10, 11 further complicating an evolutionary scenario for the origin of blood type O. This scenario would fit better if the O allele was rare in the population today and appeared in a specific people group. However, the O allele is by far the most common allele globally, indicating that if it did originate via a mutational event, it had to occur when the human population was extremely small and before humans divided into ethnic groups and spread across the globe. If Adam and Eve did not have all three blood type alleles, then there must have been a mutation creating the O allele while the human race was still very small and before humans dispersed across the globe. Whether the origin of blood type O was in Adam and Eve at Creation or whether it arose as a mutational event that took place shortly before or after the Flood, it strongly supports that all humans today are descendants of two individuals or a small group of people that eventually populated the globe. Both scenarios are consistent with the biblical model of human origins. Goldsby, R.A. et al. 2000. Kuby Immunology. 4th ed. New York: W.H. Freeman. Yamamoto, F. et al. 1990. Molecular genetic basis of the histoblood group ABO system. Nature 345 (6272):229-33. Minkoff, E.C. 1983. Evolutionary Biology. Menlo Park, CA: Addison Wesley. Sinnot, E.W. et al. 1958. Principles of Genetics. 5th ed. New York: McGraw-Hill Book Company. Hosseini-Maaf, B. et al. 2003. ABO exon and intron analysis in individuals with the AweakB phenotype reveals a novel O1v-A2 hybrid allele that causes four missense mutations in the A transferase. BMC Genetics 4:17. Patterson, C. 1999. Evolution. Ithaca, NY: Comstock Publishing Associates. Sanford, J.C. 2005. Genetic Entropy & the Mystery of the Genome. 2nd ed. Lima, NY: Elim. Cann, R. L. et al. 1987. Mitochondrial DNA and human evolution. Nature 325 (6099):31-6. Kitano, T. et al. 2000. Gene diversity of chimpanzee ABO blood group genes elucidated from intron 6 sequences. The Journal of Heredity 91 (3):211-4. Kermarrec, N. et al. 1999. Comparison of allele O sequences of the human and non-human primate ABO system. Immunogenetics 49 (6):517-26. Hartl, D.L. and A.G. Clark. 1989. Principles of Population Genetics. 2nd ed. Sunderland, MA: Sinauer Associates Inc.
* Dr. Daniel Criswell has a Ph.D. in Molecular Biology. Cite this article: Criswell, D. 2008. ABO Blood and Human Origins. Acts & Facts. 37 (2): 10.